Lots of people around the world consider themselves meat eaters. They love a good steak, pork chop, or anything with a good bit of meat in it. But as it turns out, this diet choice may come with its share of dangers, according to a recent admission by a number of butchers. Apparently, when butchers encounter cancer in cuts of pork, they don’t throw out the pork. Instead, they simply cut off the bit with the cancer and sell the rest of the meat as though nothing happened. 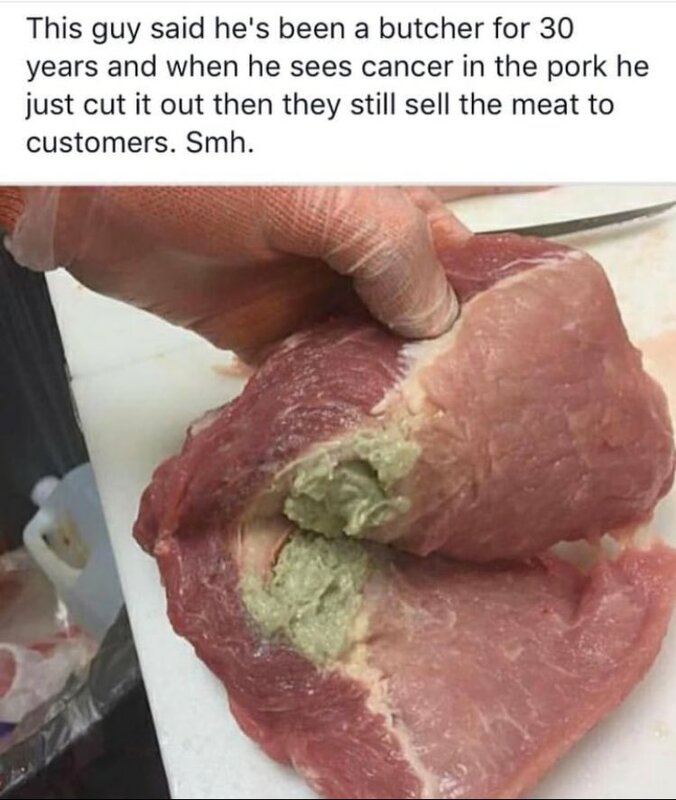 They don’t inform their customers, and cutting out the cancer means the meat still looks good enough to pass safety and health inspections. Experienced butchers all around the world have agreed that this is a virtually universal part of what they do. This information came to light after a man who spent five years working in a meat market told the story of someone he knows who has worked as a butcher for 30 years and simply cuts cancer out of pork to sell the remainder to customers. Not only have many butchers admitted they’ve done this too, but the Food Standards Agency in the United Kingdom has also stated before that any tumors found on fresh meat are usually cut out of them, and then they continue to be sold in stores. Meanwhile, a news article released in 2014 about a slaughterhouse in the United States stated that it is, thus far, believed that humans do not receive increased risk of disease from eating beef made from cows that have eye cancer. In fact, that beef typically passes inspections. A supervising vet who once worked in an Idaho slaughterhouse was quoted as saying that he had approved a few cattle with eye cancer in his time and that it would be safe to assume others in his occupation would do the same. So, what exactly is the protocol on cancer and meat in the US? 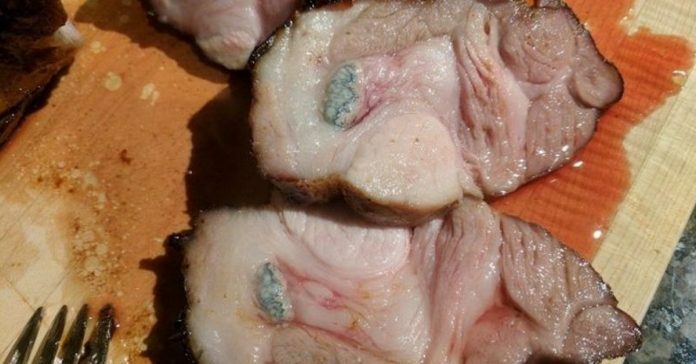 According to the Michigan State University, the USDA Food Safety Inspection Service protocol retain all meats that appear to contain tumors or lesions. These meats are then viewed by a public health veterinarian, who then approves or disapproves of whether the meat can be sold. Supposedly, cancerous tumors or lesions are not permitted to be sold to consumers. Unfortunately, these laws don’t seem to be getting follows. That’s why some staff members of the American Federation of Government Employees (AFGE) – especially those from the National Joint Council of Food Inspection Locals – or employees of the USDA who work with the Foods and Safety Inspection Service – have created a union to raise awareness of this issue. Primarily, they are focused on the degradation of the poultry-inspection procedures put in place by the USDA, as well as the potential risk on food safety caused by imported meat from China. Company sorters have been working in poultry-inspection in place of union inspectors, leading to higher numbers of defective or diseased carcasses. Does this mean you should swear off meat entirely? Well, not exactly. But how can you keep yourself safe from these issues? Shop at your local butchers, and ask them where their meat comes from or if they make their own burgers, hot dogs, and other processed meats. Ask about how their meat is made and make sure their poultry and pork are free range, and beef grass-fed. Knowledge is power!